Hello everyone, another winter themed post, making the most of it whilst I can, haha. However, I am sure many of you have heard of the Maybelline Color Eye Tattoos. Okay, EVERYONE has heard of them; but I think this one should get some more recognition this winter! This is in the shade ‘Metallic Pomegranate’. Its a deep purply colour, with a gold shimmer throughout. Its also a cream eye shadow, which I’m sure you know, all of the color eye tattoos are. This colour, to me, seems perfect for a dark smoky eye for winter time. I find this to be a good base to build up on if you’re going for the smoky eye look, its also surprisingly easy to blend out which is a plus. This beautiful colour would match perfectly if you wanted to go for a berry lip, maybe a purple or a dark red this would definitely suit that look! This stays on for such a long time as well, hence the 24 hour part, haha. I would totally recommend this for the winter time, its such a warm and festive colour. 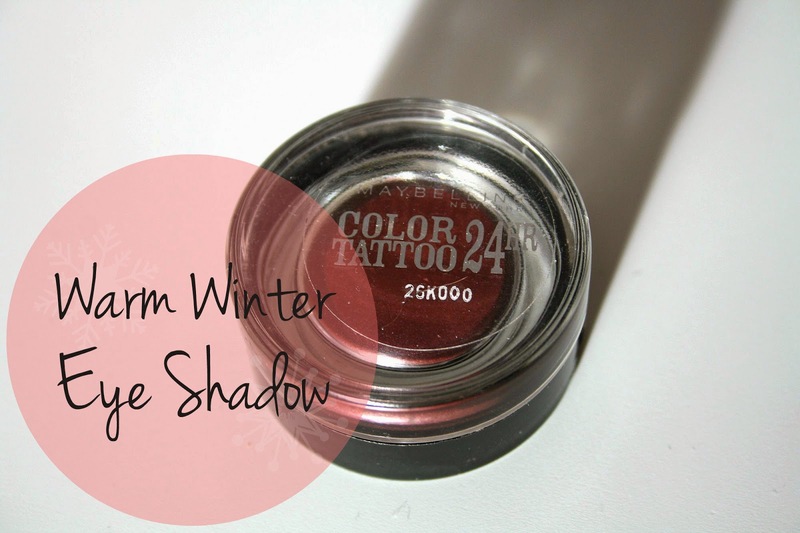 Whats your favourite winter time eye shadow? I hope you enjoyed this post, and thanks for reading.